The Regional District of Mount Waddington is pleased to announce that our new online campsite reservations system "Let's Camp" is LIVE effective April 3, 2019. The Coastal Fire Centre has decided that for the 2019 forest fire season it will discontinue use of the Fog Zone concept. Please see the BC Wildfire Service Community Bulletin for more information. The Regional District of Mount Waddington operates two recreational campsites, Bere Point on Malcolm Island, and Link River. All reservations must be secured by payment of the reservation fee ($8) plus 50% of the total nights staying for each site and each reservation (if booking multiple stays/sites). Please note that the reservation fee plus the 50% deposit are non-refundable. Bere Point Regional Park is owned by the Regional District of Mount Waddington and is located six kilometers from downtown Sointula. Signs will direct you from the ferry terminal. There are 30 campsites and a group tenting site nestled in the trees with the beach a stones throw away. You will see views of the Queen Charlotte Strait and the nearby snow-capped coastal mountains and occasionally you might see orca whales swimming by and maybe rubbing on the rocks at Bere Point. Catch the action from the whale watching platform. Bere Point is also the start of the Beautiful Bay Trail. There are two free picnic day use areas at Bere Point for public use. Outhouses are on-site but there is no potable running water, sewer or electrical service available at Bere Point campground. However, public showers, washrooms, laundry facilities and water are available at the Breakwater. Firewood may be available from on-site vendors while stocks last. From time to time there may be a fire ban imposed by Ministry of Forests, please be cautious and obey fire restrictions. The quaint Finnish Village of Sointula has plenty to offer: local arts and crafts, watercolors, homemade soaps, restaurants, library, moorage, the Co-op, dry goods, gas bar, Museum and ATM. Finnish settlers came to the island in the early 1900's naming the settlement "Sointula" which in Finnish means “harmony” and reflected the conscious decision of the homesteaders to live with such ideas as gender equality and contributions to community. Bere Point is a very popular site during the summer and reservations are recommended in advance especially for long weekends. An attendant is on-site during the summer season. Reservations are accepted by calling the Regional District Office at 250-956-3301, the non-refundable fee is $8 (eight dollars) plus 50% payment of total nights stayed. Please see the Events Calendar for reservation opening date. Link River campsite is a locally-known treasure which has 24 sites for your enjoyment, several of which are located on Alice Lake or beside Link River. Link River flows into Alice Lake and provides a great beach for swimming. As well, a boat launch and three sheltered barbeque sites are available for your use. Outhouses are provided and are accessible to those with mobility challenges however, there is no potable running water, sewer or electrical service available at Link River. Firewood may be available from on-site vendors while stocks last. From time to time there may be a fire ban imposed by Ministry of Forests, please be cautious and obey fire restrictions. Other features in the area include the stunning Alice Lake Loop Karst driving tour with stops like River to Nowhere, Eternal Fountain and Devil's Bath not far away. Curious campers might want to check out beautiful Port Alice - a small village located on Neroutsos Inlet. For avid golfers, Port Alice also offers a challenging golf course. Restaurants, fuel, groceries and a sani-dump facility can all be found in Port Alice. 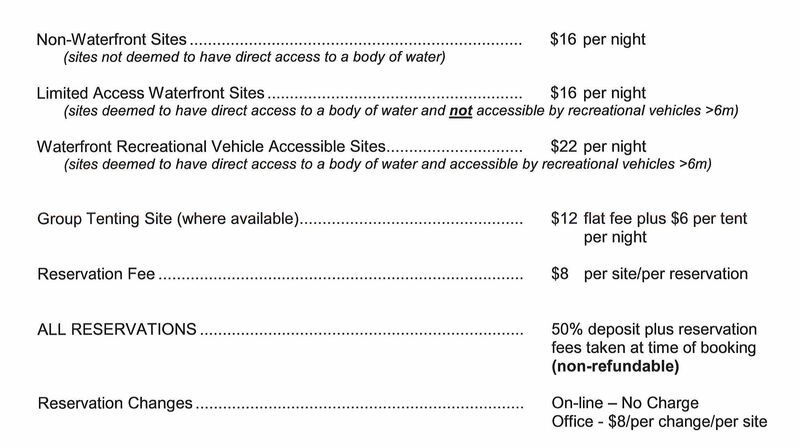 Reservations aren't required but are recommended especially for long weekends or for lakefront/riverside sites. A non-refundable reservation fee of $8 plus 50% of total nights staying will secure a site. Please check out the Events Calendar for the date on which reservations open. Call the Regional District Office to check availability and make a reservation. Northern Vancouver Island's Alice Lake Loop Tour offers one of the best opportunities in Canada to view features typical of a fascinating landform known as karst. Named for a region in Europe's Balkans where it was first studied, karst is a landscape largely formed by water action in soluble bedrocks, notably gypsum and carbonates such as limestone and marble. Please click the image to the right to view the map in more detail. Promotion and maintenance of the Alice Lake Loop Recreational Corridor is a partnership between RDMW, Recreation Sites and Trails BC (Discovery Coast) and Western Forest Products. Situated close to Woss, Mount Cain offers a unique experience to skiers, snowboarders and backcountry skiers. At Mount Cain you'll find deep powder, 21 runs, with 1499 vertical feet of terrain. Mount Cain has the highest base elevation of any coastal ski hill in BC, Alaska and Washington State. Its peak elevation is second only to Whistler. Mount Cain is located near Schoen Lake Provincial Park and is run by the non-profit Mount Cain Alpine Park Society, Vancouver Island's only community owned and operated ski hill. From December to March each season, Mount Waddington Transit runs the Woss/Mount Cain Connector Service on Saturdays from Port Hardy/Port McNeill/Hyde Creek to the Woss Store where it connects with the Mount Cain Shuttle. For matters of booking, management and operational running of the ski hill and accommodations, Mount Cain Alpine Park Society are the first point of contact. The Regional District should typically be contacted/ consulted in its capacity as tenure holder of the park. Quatse River Regional Park and Campsite is a Regional District park located within Port Hardy, managed by Northern Vancouver Island Salmonid Enhancement Society (NVISEA). With the property also home to Quatse Hatchery and Salmon Stewardship centre, this is one of the North Island's major visitor attractions. For matters of booking, management and operational running of the hatchery, centre and campsite, NVISEA are the first point of contact. The Regional District should typically be contacted/consulted in its capacity as land owner. The map to the right shows the location and landmarks of the Tex Lyon Trail from Beaver Harbour to Dillon Point. If you're looking for a challenging coastal hiking experience with a taste of forest and rocky seashore, you'll enjoy this seven kilometre recreational trail. Situated on the shores of Beaver Harbour, Tex Lyon Trail leads you to Dillon Point and provides the adventurous hiker with a panoramic view of Queen Charlotte Strait and the historic village of Fort Rupert. Picnic tables, barbecues and rest places are offered along the way and at Dillon Point, where boaters too can find access to the trail and enjoy a pleasant day on the beach. Commencing at the boat launch at Beaver Harbour Park, the trail continues in the trees behind the rock bluff, beyond the residential area at the end of a sandy beach. Hikers are asked to leave their vehicles in the parking lot provided at the park, and to watch the tides carefully when rounding the rock bluff. In other words, be sure to time your hike on an outgoing tide. You'll see a variety of bird and marine life along the trail, and encounter typical B.C. coastal undergrowth, large spruce, cedar and hemlock trees. Signs point the way to Dillon Point, and a quiet refuge, "Basket Eaters' Cove," marks the midway point along the route. High points along the trail offer a scenic vista of the offshore islands where native wildflowers abound in spring. And the sharp-eyed hiker should be on the lookout for bald headed eagles and osprey that nest in the area. Construction of this challenging recreational hiking trail was sponsored by the Regional District of Mount Waddington and funded by a Job Strategy Grant from Employment and Immigration Canada. The Provincial Social Services and Housing Ministry supplied crew members to build the trail, and the Port Hardy Lions Club assisted in construction, and will maintain the trail for the enjoyment of residents and visitors for years to come. This trail is for the rugged hiker. While a round trip can be done in eight hours, we recommend that you allow 12 hours for a return trip, and that you watch for tides. Consult your tide book, be sure to wear sturdy footwear and to dress for the weather. Happy trails! Whether in a park, recreation site or around town, it is important for the general public to review and understand these important restrictions and definitions on fires.